We are living in a generation where one doesn't get recognition until one represents himself in a way which is more appealing to the audience. From celebrities to ultra-rich CEOs, everyone used a special element which has given them fame, success in their respective businesses or even made them popular. That SPECIAL element is Marketing! Be it small, primary level businesses or Fortune 500 Companies, all of them have to represent themselves to stay in the competition of sales with the help of excellent marketing strategies. Social Media Marketing, as well as Content marketing, have become mandatory elements for increasing business sales. There are 15 Awesome Google Tools which would prove to be beneficial for you in the long run, not only for marketing purposes but also for organizing your work in a good manner! If you are working in the Marketing Department of a company, you must have this tool. This is the most powerful tool by Google which is a boon to the Marketers. If you want to know about the visitors who visit the website of your company, then Google Analytics should be in your must-have tools list. Want to make money through your blog or a website where you have thousands of subscribers as well as visitors? Then Google AdSense is the tool you should look for. You can earn a good amount of passive income as well as follow your passion of writing through blogging. Majority of passionate writers want to convey their works through blogging. But the problem is they don't want to commit to blogging platforms which are self-hosted. If you have the same problem, then Google Blogger is the solution to your problem. Now, what are you waiting for? Chase your passion for writing through GoogleBlogger! A browser which is fast in actual terms, consisting of lots of themes, apps as well as extensions, GoogleChrome is easily the best browser. Surf the net smoothly with GoogleChrome and also make sure you increase your marketing productivity by SEO Site Tools which is an extension offered by the browser. YouTube, the place where millions of visitors watch videos, be it educational videos, video songs, inspirational videos, business boosters and so on. Through YouTube, your video would be available to a large number of audience and it would definitely be a great Marketing tool for your business. A picture conveys a message, while a video conveys your whole idea! A good amount of valuable data can be known with Google Webmaster tools. Site Health, Site Optimization, Site Configuration and Site Traffic can be easily learned with the help of Google Webmaster tools. Suppose you go to a specific blog or webpage on the internet but it is in a language not used by you, there's nothing to worry about because Google Translate will translate it into your language. Google Translate has removed the language barrier in thetrue sense. For the book lovers, Google Books is one of those places which they would prefer to go for reading online. Many books of different genres are available on Google Books. If you are a writer, then you would definitely want your work to be listed here as it would boost your sale to a bigger audience. So Writers, get ready to convey your stories, literary work, fiction as well as non-fiction to the avid readers through GoogleBooks. Google insights provide you with keywords which are trending currently. The popularity of a keyword can be known with the help of Google Insights. Don't have time to read Newspapers? Want to know about the mentioning of your brand on the web? If YES, then quickly set up your Google Alerts. Google Alerts can be used to see where your competitors are getting mentioned and where they are building their profiles. Ever wished that your email account could filter your messages into different categories or labels and archive them easily? Well, your wish could be fulfilled by having an email account at Gmail. Gmail gives a professional look to your email account by organizing your inbox in a proper manner. If you want your local business to flourish, then you must list it on Google Places. You can add photos, videos to make your business available on the first page of search results. Who doesn't like to be systematic? Google Reader allows one to organize as well as view RSS feeds at one place. Many Bloggers or Content Marketers don't know how to get the best long tail keywords for their content. When you once go through Google Keyword Planner in Google Adwords you will come to know how simple it is to use for daily basis to get our articles on the top of the search results for long time. The more you use it to perform searches the more you understand it and you will become used to in utilizing it. Google Photos is a Photos sharing and Storage service where you can share, upload photos. Google implements different forms of machine learning into the Photos service as it detect and arrange your photos based on the photo content, enabling features that can automatically generate albums, animate similar photos into quick videos, surface past memories at significant times, and improve the quality of photos and videos etc Android Users can directly take backup of their photos with one google account. Who doesn't want to get free advertising from Google? If you are running a local business then you should not ignore this tool. With this tool you can get free advertising from Google. When you search any best hotel in particular city, or best web designing company in your city etc on google You will see this type of search results as shown in the screenshot below. When I searched "web designing company in bangalore" I got This box results with normal search results. After seeing the above result you will be thinking the above results should be sponsored. No but this are not paid results you can also include your listing or your local business. Claim Your local business listing in Google My Business and follow all the steps given in the Google Site then if all done well then within few weeks you should see your business shown when someone search keyword or phrase related to your business. Google Adwords provides a paid search campaign by which you can bid on the right keywords which would eventually give you a good amount of audience, leading to the enhancement of the value of the ads you pay for. With One Google Account You can access all this priceless tools. 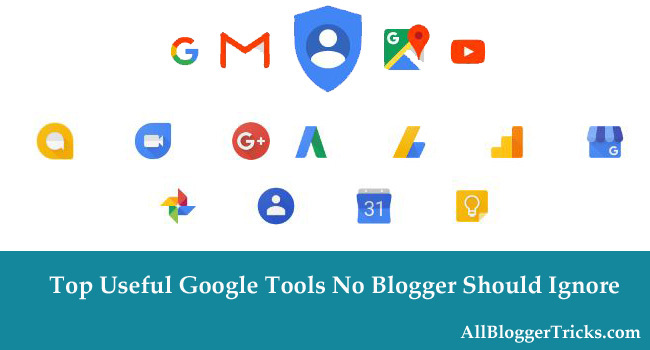 Google Made our life easy with all this free tools and more but we have mentioned the important and most used ones according to us. as they are free, some have limitations and there’s always room for improvement So Google will update and improve them time to time. Here we have shared the free tools and paid tools for marketing, blogging. so use this tools and say us which is your most used Google Tool? and Which is your most rarely used Google Tool? That's It Thanks For Following our Tutorial '' Classy Daily Used Free Google Tools Blogger Should Not Ignore '' Along With us If you found any difficulty Please Comment and Share Your Valuable Opinion. And Stay tuned for More Tutorials Like This and Share this with your friends.